Back by popular demand, we're carrying forward the Fanalytics tradition for a 3rd straight year! It's a gathering of Tableau Public authors (and those who want to find out more about what that means) for an afternoon of presentations and group viz building, followed by a meet-up to talk data over drinks. If you get that there's an incredible opportunity to apply your data skills to important (and fun) topics outside of the office, then Fanalytics is for you. This year's shin-dig occurs immediately after Sir Ken Robinson's closing TC15 keynote speech on Thurs, October 22nd from 3:15pm to 7:00pm PT, in Grand Garden Arena Studio Room 95 - ST-B. $0. In typical Tableau Public fashion, Fanalytics is free for all to attend, not just TC15 attendees. After the panelists have shown their work and given their presentations, we'll break up into small groups and get to work turning a data set into visualizations, dashboards and data stories. 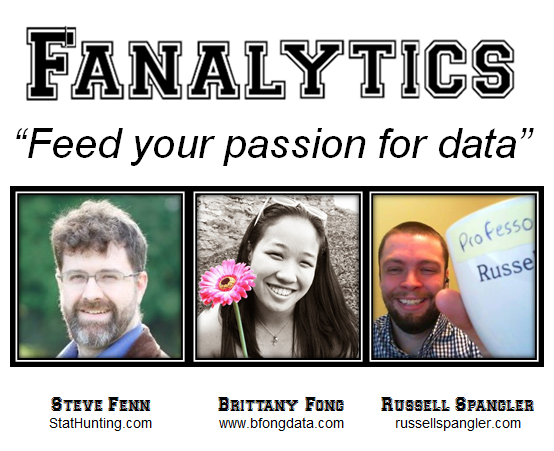 And of course no Fanalytics Workshop would be complete without a friendly competition - our panelists will judge the submissions and one lucky group will win a grab bag of fancy Tableau clothing and swag. Lastly, we'll wrap it up by chatting over drinks, because who's not a fan of that? There's no registration this year, so be sure to hurry over to the meeting room after the final keynote and grab a chair before they're all taken!